See all the games here! See what other players have to say about this game and others in the NSider Forums. Developer: Nintendo/Creatures Inc./GAME FREAK Inc.
Pokémon Yellow: Special Pikachu Edition is a great way for new Pokémon Trainers to enter the Pokémon universe, and it gives experienced Trainers a new challenge in their quest to become the world's greatest Pokémon Trainer. The major innovation in Pokémon Yellow is the starring role of Pikachu. You start the game with a Pikachu, which is the only one in the game. If you place Pikachu in your party, it will follow you around. Pikachu's mood will change depending on how you've been treating it. Pokémon Yellow is compatible with the Game Boy Printer. For example, you can print out pictures from your Pokédex. Pokémon Yellow features all-new pictures of all Pokémon found in Red or Blue. Your Pikachu can evolve into Raichu, but must first be traded to Pokémon Red, Blue, Gold or Silver. You can enter a new building just below Fuchsia City and, if you have a Surfing Pikachu, play a side-scrolling minigame. This game is also called Surfing Pikachu. Your goal is to perform as many radical stunts as possible. You can print out your high score. Gnarly! Weedle, Kakuna, Beedrill, Ekans, Arbok, Raichu, Meowth, Persian, Koffing, Weezing, Jynx, Electabuzz and Magmar are not found in Yellow. You must trade for them. Other Pokémon are found in different areas. On a Game Boy Color, the enhanced colors in Pokémon Yellow are better than the colors seen in Pokémon Red and Blue. However, the opening sequence is the only portion of the game that uses GBC's full 56 colors. Like Pokémon Red and Blue, Pokémon Yellow is fully compatible with monochromatic Game Boy systems. Jesse and James, the bumbling Team Rocket duo, are found several times through normal game play. Bulbasaur, Charmander and Squirtle can all be found in Yellow. To receive them, you must complete special tasks. Gym Trainers use different strategies and are more difficult to defeat. The Unknown Dungeon is different in this version. 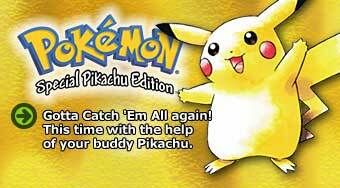 With two Pokémon Yellow Game Paks, two Game Boy systems and a Game Link cable, you and a friend can enter three new battle modes: Pika Cup, Poké Cup and Petite Cup. Where do you play Nintendo Wi-Fi Connection?